Captain Robert Prah was born in Mt. Pleasant, Pennsylvania. 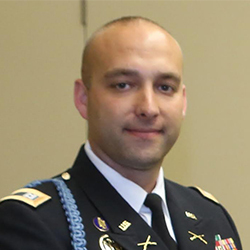 He joined the Pennsylvania Army National Guard in January 2001 and participated in Operation Noble Eagle (Homeland Security) and Operation Iraqi Freedom 2009-11. In addition, Captain Prah earned his Bachelor of Science in Criminal Justice and Master of Science in Law & Public Policy with a concentration in Homeland Security from California University of Pennsylvania. Captain Prah has been employed as California University of Pennsylvania’s Director of Veterans Affairs since 2007. In his community he serves as Vice President of Smithton Borough Council and also an active member of American Legion Post 790. He is very active with organizations such as Iraq & Afghanistan Veterans of American, Team Red, White & Blue, American Legion and Military Officers Association of America. He resides in Smithton, PA with his fiancée Carolyn, who is currently serving in Afghanistan as a Brigade Human Resources Officer.